As I have my finger on the pulse of pop culture, I watched Wall-E on ABC Family yesterday, and I’m glad I did; with the 50s aesthetic and the social system based on laziness, it’s pretty much the film version of this blog. There’s an interesting aesthetic choice, which it shares with another 2008 cultural product, Fallout 3. The intro of each introduces the post-apocalyptic landscape accompanied by a soundtrack that recalls the pre rock and roll music of the 50s (actually, Fallout uses an Ink Spots track from the 40s, while Wall-E uses a song from 60s musical Hello Dolly; the post-war, pre-neoliberalism “long 1950s,” as it were). This inserts us in a future world in which the apocalypse somehow took place in the 50s, or at least, in the aesthetic of the 1950s, as we see in the decaying Googie architecture and atomic-age trash that clutter the landscape in both. This strikes me as an interesting limit-case of the way our image of the future is still tied to the way in which the the future was imagined in the 50s (the “where’s my jetpack” problem). We’re so incapable of imagining a new future, we can’t even imagine the end of the world without borrowing from the past. This especially a problem for Wall-E; in Fallout, the apocalypse is a nuclear holocaust arising from war with China, that is, it is an apocalypse on a 1950s model. But the environmental disaster in Wall-E is much more modern; that even this has to be imagined via the 50s suggests some fairly significant limitations to our historical imagination. The out-of-place 50s aesthetic also reveals something interesting about the way in which Wall-E understands environmental catastrophe, which becomes apparent when the action in the second half of the film moves from the Googie-detritus-cluttered Earth to the luxurious spaceship. 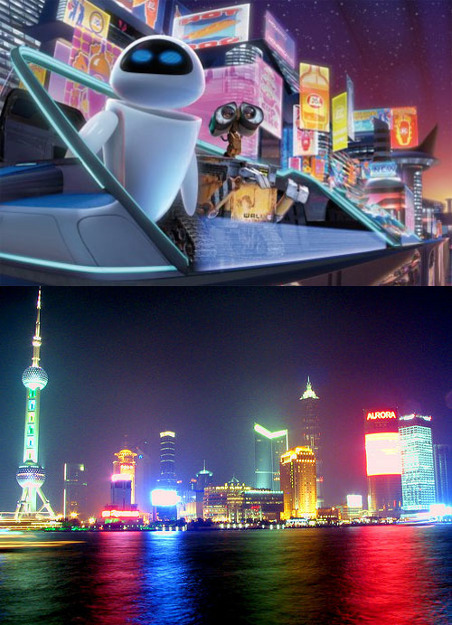 As Wall-E zoomed into the neon-lit interior of the spaceship, I thought we had moved to Shanghai. The film’s model for the decadent future, that is, the quintessential postmodern, postfordist city, which is contrasted with the stilled machinery and modernist skyscrapers of the first half of the film. What this seems to set up is a strange vision of Fordism as a kind of virtuous Eden; Wall-E is the Fordist worker, engaged in proper work, before the fall caused by the introduction of a consumer society, and this is reinforced by the human return to Earth, and to manual labor, at the end of the film. This doesn’t make much sense as an analysis of Fordism: a social system of mass consumption is what makes the economics of Fordism possible; the incoherence is reinforced by the aesthetics, because Googie is not a dour and industrial style, but a consumerist one. Indeed, what seems to really exercise the film is not so much consumerism or environmental destruction, but virtualization or immateriality. This is clearest in the way the fat humans in space are surrounded by their screens, using videophones to communicate even with people next to them, with one human being liberated by Wall-E’s interruption, forcing her to turn off her screen and confront the unmediated world (and, later, another human) apparently for the first time (leading to a weird moment where she gazes in wonder at the beauty of the neon billboards, which she’s never previously seen; if the humans are all embedded in their virtual world, to whom are the billboards directed?). More subtly, it seems to me this horror of the immaterial is embedded in the consumption we see in the second half of the film. While the humans are fat and consume both ravenously and lazily, the film doesn’t seem to be so concerned by the fact that, say, what they are drinking is full of sugar, as that it comes in a giant, Buy-and-Large branded, cup. It’s not the consumption of things which is the problematic part of consumerism, in other words, but the consumption of symbols. This also explains another puzzling feature of the film: the valorization, in a film supposedly worried above all about waste and useless trash, of Wall-E’s collection of the discarded ephemera he finds among the trash-heaps of Earth. Why are these objects worthy of respect and preservation, rather than being further examples of where consumer society has gone wrong? I think the answer is that they genuinely are objects, divorced from the symbolic context of branding and immaterial capitalism: even though they may be mass produced, they do not share the kind of symbolic production that produces commodities as branded commodities. Writing back when the film came out, k-punk described Wall-E as a “bricoleur-hauntologist, reconstructing human culture from a heap of fragments.” It is the disconnection of objects from meanings which makes reconstruction both possible and necessary, and it also raises the possibility that the culture reconstructed might be different from the original construction (I’m reminded of Joseph Cornell’s collages). This suggests a more positive political program than the Fordist nostalgia and moralizing anti-consumerism that make up the most obvious message of the film. Can we ourselves, without waiting for the ecological apocalypse (or, even in the shadow it casts from the future) undertake this kind of bricolage, and liberate commodities from their commodification, assigning them new meanings and new uses?